Discussion in 'Oakvale Town Square' started by gerzev, Oct 17, 2010. Hi. I've been going to this site for Fable 3 news for a few months now and I just noticed a few days ago that there's a forum as well. So about me.. I'm a fan of Fable since I got Fable II two years ago and I loved it. Still haven't played Fable I but I'm planning to do so as soon as I get a new PC, dunno when that's gonna be though but we'll see.. As of now I find Fable III more important and of course I pre-ordered it for Xbox, as well. I'm not really much of a gamer, however when I do it's mainly RTS games like Age of Empires or adventure games like the now ancient Quest For Glory series (I doubt anyone here knows about these series, but you should def give them a try ), and of course Fable. I'm 17 years old and I live somewhere in Europe. English is not my native language but I think I speak it well enough to make myself understandable here, if not I'm sorry.. Next to English I speak Dutch and German as well. Wanna know anything else, just ask.. anyway HI!1!11! Nice to meet you, gerzev. If you had been a native speaker of English I'd have been impressed. As a second language? Really impressive. Fable II is what interested me in the Fable series too, but as I did not own an Xbox, Fable (The Lost Chapters) was still my first Fable game. 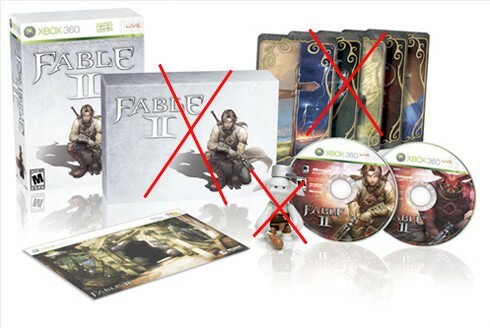 Let's keep our fingers crossed that Fable II lives up to expectations! I am almost certain I'll enjoy it anyway.. Welcome to the forums mate, you'll fit right in here! How could you see through my passive-aggressiveness? Beer goggles. You should try them on. Welcome friend! Hope you like your stay in our side of town! Ehehehe. You've been coming to the frontpage for news? So you probabñly just found out that the LCE of Fable II got chopped down huh? welcome to the forums. where anything is possible. the unattainable is unknown, the impossible is attainable. the only limit is yourself. I have no idea if that's actually German for welcome or not. I saw it at Busch Gardens in their little Germany-themed section, though. I'm sure that counts. Well, I didn't find that out. What got chopped? I mean, not that I wanted most of it, and not that I actually got the LCE, but whatever. i hope you understand how seriously we take sexual harassment here. even implication is severely punishable. It is, and you even spelled it right. What's the silvery box with the x on it? Yay! Busch Gardens has yet to fail me. Also, great roller coasters. I'm sorry, I just don't really care for limited editions. Sure, the in-game bonuses are cool, but I'm sitting here going, "oh, wow, more stuff to litter my room. Awesome. Why would I want that again? What use is it?" Which makes it hard to care that an overpriced cardboard* box is one of the things that gets dropped. walker. go back to sleep! Welcome Gerzev, nice to have you here and glad you managed to find the forums.